To get acquainted with the painter Ton Schulten and his works, groups can book a guided tour. We would like to discuss personally with you the possibilities for your group. A visit to the Museum Ton Schulten is almost synonymous with getting to know the painter’s innermost thoughts. His world, his way of thinking, his vision and quest are not only revealed in his paintings, but also in the wonderful documentaries that you can view here. The painter of Consensusism, with his lively imagination, his zest for life, talent and harmonic words, truly stands out in these surroundings. Museum Ton Schulten forms a unique and impressive backdrop for the works by this artist from Twente, which are just as unique and impressive. 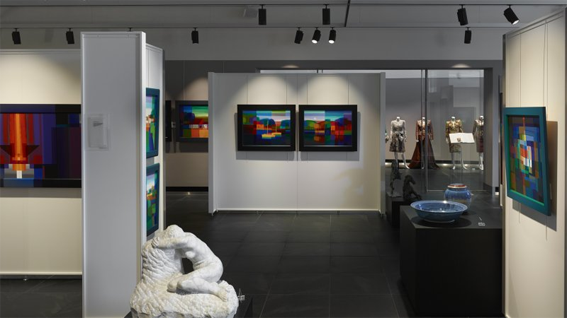 This cathedral of colour and light is not only home to the exhibition rooms where Tom Schulten’s works are permanently on display, it also has a separate, themed space where a variety of national and international guest artists can set up a temporary exhibition of their works. Museum Ton Schulten is a vibrant cultural centre that has a restaurant where you can enjoy a culinary experience until late in the evening . The special complex also includes a theatre – cinema, as well as a large museum shop. Come and enjoy the beautiful summer colored paintings by Ton Schulten. In this inspiring environment, work and relaxation can go together in an exclusive way. Be surprised by the constantly changing collection in our webshop!